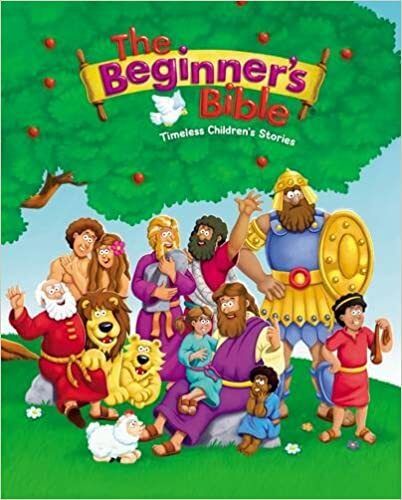 The Beginner’s Bible® has been a favorite with young children and their parents since its release in 1989 with over 25 million products sold. Now it’s redesigned with fresh new art that will excite children for many more years to come. Full of faith and fun, The Beginner’s Bible is a wonderful gift for any child. The easy-to-read text and bright, full-color illustrations on every page make it a perfect way to introduce young children to the stories and characters of the Bible. With new vibrant three-dimensional art and compelling text, more than 90 Bible stories come to life. Kids ages 6 and under will enjoy the fun illustrations of Noah helping the elephant onto the ark, Jonah praying inside the fish, and more, as they discover The Beginner's Bible just like millions of children before. The Beginner's Bible was named the 2006 Retailers Choice Award winner in Children's Nonfiction. Cassandra's Review- This is the best time of the year to bring such a fantastic book into the hands of children, who will benefit greatly from all of the adventures told. It is a timeless story book that has a potential of taking your kids on imaginative journeys. While it is faith based, everyone will have a have great time discovering all about the Bible. If I won, I would keep it for my own kids so we could read it together! I' give it to a friend! They could really use this. I give this to my daughter to introduce her to the bible and all of its stories. I would keep it and read it to my son and daughter as well as my children's bible class on Sundays.